A generic property of the motion along every allowed trajectory in a semantic state space is that Hiesenberg-like relations hold. Under the condition that the action on each allowed trajectory is stationary, it is possible to define “energy,” “velocity,” and “mass.” The so defined energy is not constant along the trajectory because of permanent mass-energy transformations. Yet, unlike Einstein mass-energy relation, the amount of energy and mass that is transformed is permanently kept bounded along the allowed trajectories. The control over local accumulation of matter/energy in a structured network is implemented through spontaneous emitting of a matter wave. The stationarity of action governs grammar rules, which sets non-random picking of successive semantic units, i.e. word order is a sentence, thus providing non-extensivity of the semantic-like hierarchy. The major part of our research is to establish what makes a complex system “intelligent” and to answer the question why it has to retain certain “indifferent” to intelligence properties. In the first part of the book we have considered the second part of this research issue. We have successfully explained the typical for complex systems properties regardless to whether they are intelligent or not. Thus, we manage to put in a self-consistent way the systems` sensitivity to initial conditions and the power laws. We relate these properties to the stability of a system. Thus, the main advantage of our approach is set by its exclusive ability to reconcile the confrontation between the power laws and sensitivity to initial conditions on the one hand and the empirically observed stability of the complex systems on the other. 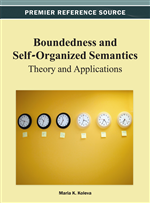 Yet, it is expected more from this approach: we expect that the concept of boundedness which we put forward as an operational protocol for governing the behavior of complex systems also governs the intelligent-like response of a large class of complex systems. At first let us specify the notion of an intelligent-like response. By this we understand an active response which is not reducible to a sequence that exactly matches the properties of the corresponding impact. To compare, the traditional approach of statistical physics sets the response passive, i.e. it always follows the environmental impact. Instead, our concept of boundedness suggests the response to be determined by local factors only: it is specific and is determined by current local state and current local impact; the response and the impact are subject to the mild constraint of boundedness which asserts that the response is self-organized so that to stay within margins dictated by the thresholds of stability so that the rate of exchanging matter/energy with the environment is kept bounded. Then, the response turns out to be a two-component variable: an active specific self-organized pattern which is robust to small environmental fluctuations and a passive, universal component which retains certain characteristics which are insensitive to the statistics of the impacts and responses. That is why we called the robust self-organized part of the response “homeostasis” and the other non-specific one, noise component. A systematic study of the generic properties of the coexistence of the homeostasis and noise is presented in the first part of the book.